If you haven’t played any awesome little indie games lately, now is a great time to catch up. The Humble Bundle for Android #3 — a package of games you can name your own price for while also supporting charity — has one week remaining before it expires. To sweeten the pot for potential players, four new games have been added to the already stellar line-up. You can now net nine top-notch Android games for $6.22, though the basic four games bundle is unlocked for any price you decide to pay. If you decide to opt to name your own price and go below the average purchase price, you’ll find yourself in possession of Fieldrunners, BIT.TRIP BEAT, SpaceChem, and Uplink. For $1, a Steam key will be included, making the games available on your PC, Mac, or Linux computer. If you pony up and go above and beyond the average purchase expense — currently at $6.24 — you’ll also nab these top notch titles: Spirits, World of Goo, Osmos, Anomaly, and EDGE. No matter how much you kick in, you’ll be rewarded with the soundtracks of your new possessions as well. The Humble Bundle has been distributing packaged indie games at a discounted price since the spring of 2010. In the 14 Humble bundles available since its launch, the packages have sold just short of $20 million. The money is distributed amongst the game developers, charities, and the Humble Bundle company itself, and the amount for each is determined by purchasers. 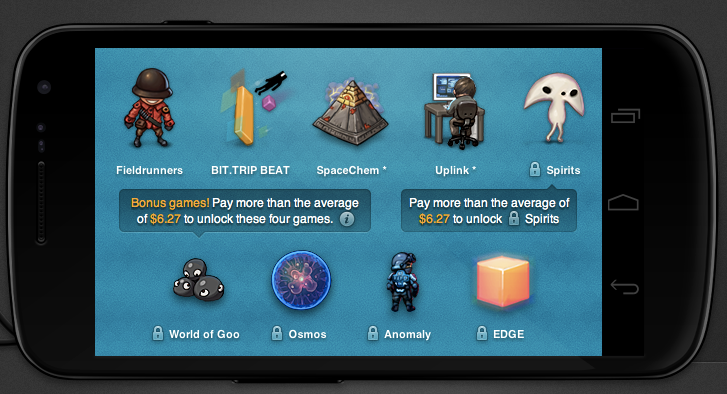 The Humble Bundle for Android #3 has brought in half a million dollars in its first week. Pitch in however much you’d like to that total and snag some great Android titles.